I watched with sadness the news about yet another school shooting–and the tragedy that has touched so many lives. The reasons behind the shooting are as yet unknown…and may never be truly understood. What has come out so far is that the young man who appears to have been the shooter had a troubled family life and–apparently–seems to have felt bullied in some ways. I watched some of the students who knew him last night say that while he was a quiet young man, they weren’t aware of any bullying that took place…any overt bullying. But he was a quiet boy, seemingly on the outside looking in. I wonder, though… Other students may not have been aware of any bullying, but if he perceived how he was being treated as bullying and non-acceptance–whether at school or at home–then his reality was that he was being bullied. Perception and reality aren’t always the same thing–at least, not as we see them. But one’s perception is one’s reality, and we ignore that at our peril. There seem to have been some warning signs that were missed…missed, perhaps, because his schoolmates and teachers saw him one way and couldn’t correlate the warning signs with the person they thought they knew. It’s time for us to take a close look at ourselves…perhaps time to ask someone else for feedback. How do we come across in our treatment of those who don’t quite fit into our groups, our communities? Do we leave them on the outside, wishing they could be in but uncertain how to get there? Or do we draw them in? Perception and reality…do they mesh? Or are we looking in a fun-house mirror, seeing distorted images? Imagining we are interacting in one way but being perceived in a totally different way? The way we view things is really only a reflection of our self beliefs, and not necessarily ‘how it really is’. Dr. Phil puts it this way, “There is no reality – only perception”. We all create the world around us by our thoughts and beliefs, and our perceptions of events (and of ourselves) determine how we experience life. If we believe that life is gloomy, then we will perceive gloom in events and by that perception we have drawn gloom into our lives and gloom is what we then ‘experience. We only need to look at a situation from a different angle, or from another’s point of view, (or see the ‘bigger’ picture), and that can totallychange our experience of life and its myriad of events. May we work together to make a world that all people can see as a loving world. Our continued existence depends on it. Sunday we had quite a day! Yes, we had our “normal” Sunday morning service, and that was a good experience. But there was more. Right after the service we quickly changed our sanctuary set-up into our fellowship hall set-up (they’re both the same room) and prepared for our potluck. This wasn’t just any potluck…it was the beginning of the memorial service activities for a member of our congregation who had died a little over a week ago. He didn’t have a conventional home–not because his family didn’t care for him. They did, but for whatever reason, he chose not to live with them. He found a home in our congregation–and brought other members of his community as well. Initially they joined us because of our potlucks. And so we began our memorial service with a potluck in honor of Dave…and also, because Jesus–even as he was preparing for the difficult end of his life–took time to break bread with those he loved. We gathered–and filled the room! We had been unsure how many would be there–and whether we would have enough food. So we had been praying for a loaves and fishes miracle…and we received that blessing before we ever began! We had food coming out of the woodwork! We had food enough to feed everyone as much as they wanted–and enough leftovers to send home with those who needed food for the next couple of meals. We had members of all of Dave’s communities there–his birth family, his church family, his high school friends, and his homeless community. For someone who didn’t seem to have too much, there were many lives that he had touched. We shared in a drama–a drama that ended in the hope of Christ’s healing love for all of God’s children…even the ones who seem to be the lost. And we sang–sang of the hope to be found in God. We didn’t all come from the same backgrounds or faith traditions. But we drew together because we had been touched by one person’s life…a person who didn’t seem to have much to give (at least as it would seem to the world), but who gave of himself in so many ways–caring and concerned about those whom he came in contact with…a minister of presence. On behalf of the family of David; I would like to extend our heartfelt gratitude for the powerful words of friendship you have shared with us over the past few days. Your kind words have offered comfort to our hearts; and have made present the very real meaning of what it means for the people of God to be a church. Perhaps you know; our family comes from the Roman Catholic tradition, however, you welcomed us into the Community of Christ with ‘Open Arms.’ This gesture highlights what it means to be a church, and indeed what it means to be the collective Body of Christ. Perhaps the most powerful display of praise was indeed the coming together of two faith traditions to celebrate Dave’s life; but all the more powerful to celebrate a loving and steadfast God. Your efforts to bring comfort to Dave’s life did not go unnoticed in this world, and will certainly not go unrewarded in the world to come. You have lived the words of the Gospel, in that you gave dignity, compassion, and comfort to “the least of His.” Your compassion for the alienated of our community is a testament to the good work the Lord has begun in your ministry. 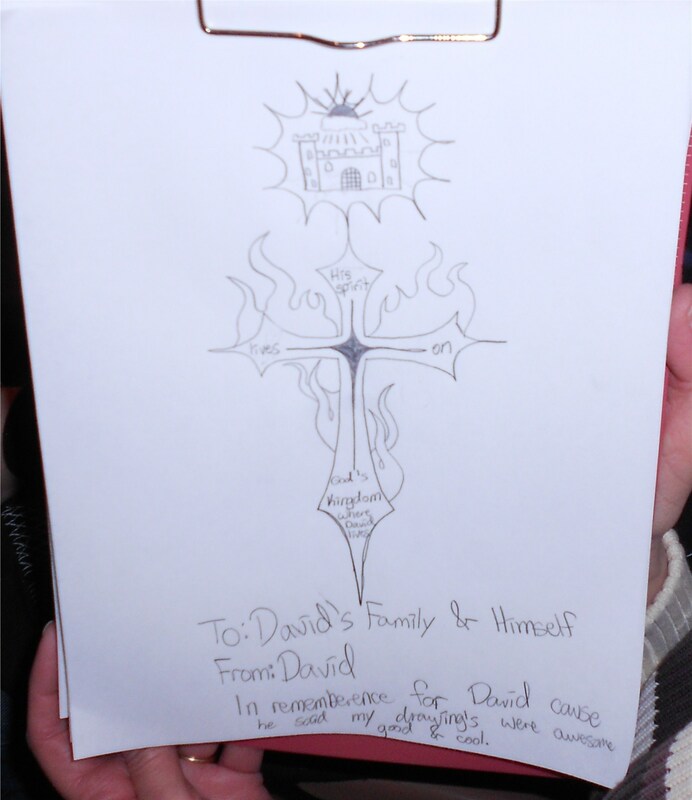 Our hearts are filled with the great promise of salvation, both for Dave, and indeed for all of us who profess the power of our Living and True God. Let us continue to pray for one another; as we seek the healing power of the Spirit of the Living Christ. Who are we crying for? I’ve been thinking about this question this past week…since Whitney Houston’s death. The type of music she sang is not my favorite–but she was a good singer. I am not downplaying the tragedy of Houston’s death–or any other individual’s death. Her past battles with drug abuse are indeed tragic and affect many individuals, including her ex-husband and daughter. What I do wonder about, though, is this: What makes one person’s death any more worthy of an outpouring of grief than the deaths of innocent children? Or anyone caught in the middle of violent conflict? or suicide? or death because they’ve been “thrown away?” or any of a number of other reasons…you can think of your own. I was reminded yesterday of our seeming inbalance about who we consider important. NPR did several stories yesterday about the death of a gifted young foreign correspondent, Anthony Shadid. He felt it almost a calling to be able to help us understand what is going on in different parts of the world we may never travel to–in his case, the Middle East. He was not an “adrenaline junkie”–he spent his time in one area, taking the best care he could but still–because of the violence in the area–putting his life in danger. His death, though, was not from a bullet. It was apparently from a severe asthma attack as he was covering what is happening in Syria–and he leaves a wife and two children. But has his story gotten anywhere near the coverage of Whitney Houston’s death? No. I haven’t heard any mention of it anywhere on the national news…and yet, he was one who was trying to help us understand the issues that cause millions to die–and few of us cry. So…who are we crying for? What do we cry for? Last weekend I was at a workshop that was the beginning of the introduction of my denomination’s new hymnal (which will be officially debuted in October 2013 at our annual Peace Colloquy). This was just an introductory glance with opportunities to talk about worship planning, how to be true to the cultural traditions of the songs that come from non-USA (and non-white USA) traditions, how the hymns speak our theology, encouraging congregations toward continued vibrant singing through keyboard and guitar accompaniments…and, of course, to sing! As we were singing through many of the hymns, I got to thinking about how our singing shapes our faith…perhaps more than anything else we do. One of the workshop presenters reminded us that we teach our children the alphabet by setting it to music, because that makes it easier to remember. Scripture and tradition are important–but what we sing is what we remember, even when everything else fades. Our last hymnal came out in 1981. It has been an important part of who we are, but much has changed over the past generation, and some of the theology we sang then no longer meets our needs. As we have (hopefully) grown spiritually, we have changed. We have sensed God calling us in new directions–and our hymnody needs to reflect those changes. As I sang some of our new hymns, I realized that while I was comfortable with what they were saying, there are many for whom these words will be a struggle…if they truly read them. That’s the other challenge of a new hymnal. Often we have become so comfortable with the songs that we have sung for a generation (or more) that we don’t really pay any attention to the words. And so the question arises: Do we really mean what we’re singing? Really? Maybe that’s part of the reason we need new hymns and new hymnals every generation…to get us out of our comfort zone and to shock us into thinking about what we truly believe. “All to Jesus I surrender…” (Judson Van de Venter) Do I really mean that? “For everyone born, a place at the table…” (Shirley Erena Murray) Am I willing to sit with everyone at God’s table? “Christ, you call us all to service, call us all who follow you; plant in us a deep commitment all your work and will to do. Fire a passion for your justice, in us kindle love of peace; help us heal the brokenhearted, to the captive bring release.” (Joy Patterson) “Us” includes me. Do I want that to happen in my life? There are many old favorite songs that are part of my life that have made me who I am–and I am looking forward to many new favorite songs that will continue to shape me on my spiritual journey. Yes, I believe in angels…and I believe they come in all kinds of different forms. This past weekend I was blessed by a 4-legged one. I’ve indicated before that I’m owned by a schnoodle (a schnauzer-poodle mix…small variety). Rascal is independent and while he sometimes demands attention, such as going for a walk or being played with, his decision to sit in your lap is definitely his. I can pick him up and put him in my lap, but if he doesn’t want to be there at that particular moment, as soon as I take my hand off his fur, he’s hopping down and heading off to do what he wants to do. I didn’t feel good this last weekend. I was fighting a cold that left me feeling like I’d been run over by a truck! I slept more hours during the day than I’ve slept in years, and didn’t feel like doing anything except laying in the recliner. Rascal knew it. Someone–in the ways animals know–he knew I didn’t feel good. He knew I needed loving attention…and he spent hours curled up in my lap, just being there. When he sensed I was doing a little better, he left my lap…but not the room. He went back to the chair he has claimed as his own, where he could continue to watch me. When he comes in from “doing his duty” outside, he normally can hardly wait for his reward (a mini carrot). But especially when I was feeling my worst, he would come in, come check on me, and then return to my husband to get his carrot. I’m back at work now. Still fighting the last of the cold, but definitely feeling better. Rascal can’t talk–not in the ways we humans do. But he brought a ministry of presence and unconditional love that was a blessing as I recovered. You’d think that after having lived a significant number of years, I’d have learned by now to listen to what my body tries to tell me. And you’d be partially right. But there are times when my Type A personality gets in the way–and I tell my body that it really doesn’t know what it’s talking about. It will take that for a little while…but eventually it will have had enough. If I won’t listen willingly, it will shut me down until I really open my ears. I knew I’d been pushing myself between things that I needed to get done at work and things that I wanted/needed to do at home. I’d said “yes” to a few too commitments, but I figured I could handle them all. My body kept saying “You’re trying to do too much…you need to slow down.” But I was like a driver, sure he can get through that light before it turns red, even if he’s half a block away and the light is turning yellow! Wednesday evening I started sniffling. Darn! Too many things to do this upcoming weekend–I can just gut it through. Thursday changed my mind! I went in to work because I had a commitment that I had to take care of (unfortunately in the afternoon). By the time it was 3:30 (when I was supposed to take care of the commitment), I was feeling absolutely lousy and wanted nothing more than to go home and crash in bed. As it turned out, the reporter also was sick and going home–so I headed home 1-1/2 hours earlier than I had thought I would be able to. As soon as I walked in the door, I changed into pajamas, sat in the recliner, and immediately went to sleep. During the next 24 hours, I think I was awake only 3. Today is Saturday. There is an activity I was supposed to be at today–but I’ve learned (again) that when my body tells me to slow down, I’d better do that. This activity will be offered again later, and I need the rest today to prepare for a commitment I’ve made for tomorrow that I really do need to cover. Maybe one of these days I’ll really learn that listening to my body is important–and will help me live better and more effectively. Maybe I’ll live long enough to become truly wise. As Norman Cousins says, “Wisdom consists of the anticipation of consequences.” One of these days, I’ll really believe that when my body warns me to slow down, I’d better do it willingly–or it will find ways to make it happen!